Many homeowners in Northern Virginia limit their use of their landscapes to “pool season”—that period of time between Memorial Day and Labor Day when they know the weather’s going to be warm. But there are ways to enjoy your outdoor living spaces far past this time of year. With the right landscape elements, you can extend use of your landscape to provide you, your family, and your friends with an outdoor area to spend time in all year long. 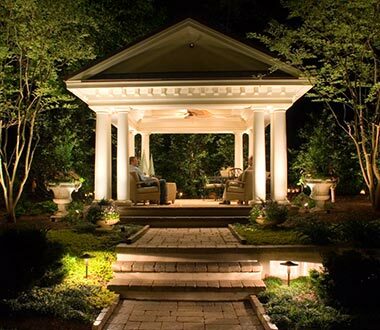 Install a landscape lighting design. 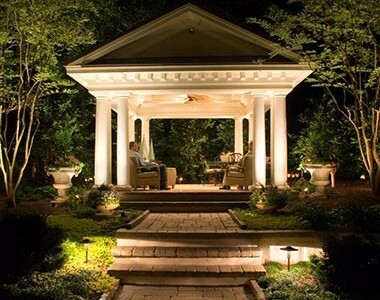 The right outdoor lighting plan can keep your property safe and secure—deterring intruders, keeping your walkways well-lit so your guests can find their way, and providing the light you need to enjoy the scenery and host outdoor parties. Include an outdoor fireplace or fire pit in your landscape. A fireplace or fire pit is not only a beautiful addition to any patio or outdoor kitchen, but it serves a very functional purpose as well. It enhances the aesthetic of your landscape in the winter months, provides a place to gather around and stay warm with friends and family, and helps to further illuminate your outdoor living spaces. Create an outdoor kitchen and bar area. This provides a great space to entertain guests in your backyard, no matter the season. Add seasonal color. It’s not just about staying warm and keeping your property well-lit. It’s also about creating views you can enjoy year-round. When you’re planting a garden or installing plantings throughout your property, be sure to consider which plants will bring color to your landscape during the winter months. Check out our previous posting on bringing year-round color to your outdoor space, where you’ll find recommendations on different species of plantings for every season. Let Us Help You Extend Use of Your Northern Virginia Landscape! At O’Grady’s Landscape, we have been building out the landscapes of Northern Virginia homes since 1991. We can help you create a year-round landscape with the right plantings, hardscapes, and lighting lighting designs. An initial consultation allows our landscapers to get a feel for what you’re looking for so we can offer recommendations based on our experiences and that also suit your personal tastes and the rest of your home design. When you’re ready to speak to us about creating a year-round landscape, give us a call at 703-533-5001 or request a consultation online.